Is the practice of medicine a different experience for male and female physicians? Two recent studies from athenahealth suggest that it is — in ways that should make us rethink what we value in health care. As a physician who left clinical practice because of burnout, I’ve wondered about the relationship between gender, stress, and burnout for years. The data confirm some trends I’ve written about. But what is causing women physicians to be less productive and yet more stressed? One explanation is work-life conflict and lack of parity in the division of work at home. Among the many female physicians I know or have interviewed, none has a spouse who takes on the bulk of the home and child duties. Indeed, research shows that female physicians are far more likely to have a spouse who works full-time outside the home than their male peers — 85.6 percent vs. 44.9 percent in one study. But there’s another explanation, with deeper implications for the future of health care: Perhaps the type of work that female physicians tend to perform is undervalued in current reimbursement models. 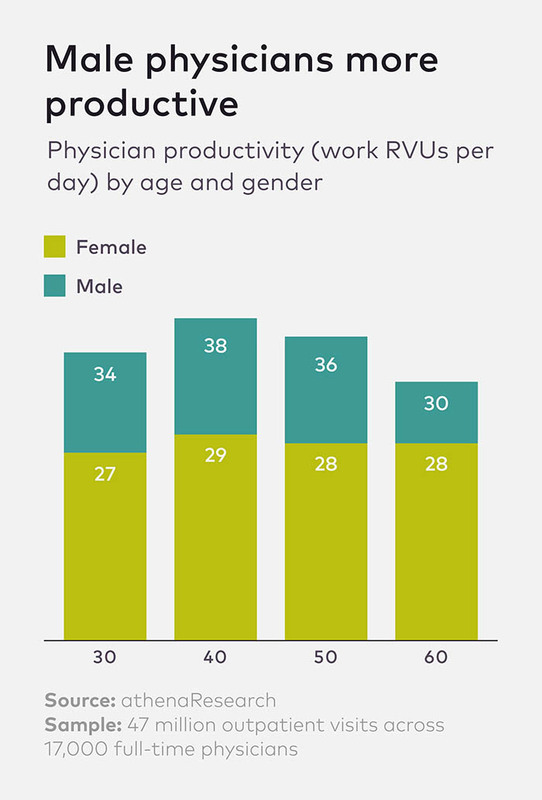 Female physicians may be less productive, as traditionally measured, and at greater risk for burnout, because they are performing activities that are time-consuming yet not captured with traditional RVU-based measurement. To keep up, she would work beyond her assigned shift and spend several hours in the evening catching up on documentation. Exhausted and demoralized by the conflict between “coding” and caring for patients, she left practice. Studies show that female physicians are more likely to engage in addressing the psychosocial needs of their patients and to provide educational counseling than their male peers. A 2012 review of nine studies found that patients’ preference for a female gynecologist was partially explained by the fact that the female gynecologists used a more patient-centered communication style. Perhaps because of the difference in approach, female physicians spend 10 percent longer on visits than male physicians — an average of 2 minutes, according to one study. The same researchers found that female physicians’ patients speak up more, and disclose more information to their physicians, than the patients of male physicians. The use of patient-centered communication can be time-consuming. Female physicians report feeling more time pressure than male physicians, saying they needed 36 percent more time for their work, while male physicians reported needing an additional 21 percent. 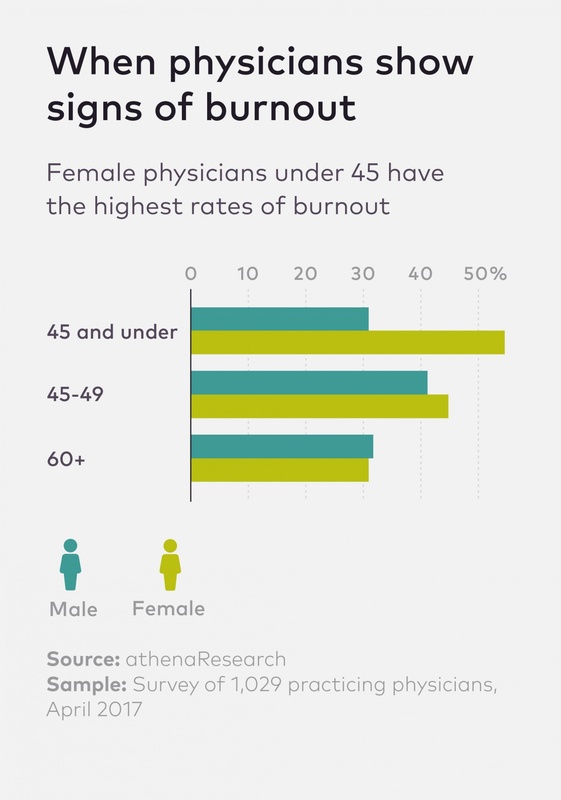 Over the years, I’ve interviewed scores of physicians (female and male) who have talked about the importance of this kind of communication — and the associated time pressure that can lead to burnout. At a family meeting, my two sisters and I described our mother’s symptoms in greater detail than possible in the admission record. We relayed an important element in our mother’s recent history: her tendency to quickly retain fluid with any dietary salt and a recent move to a memory unit in a nursing home that doesn’t offer a no salt diet. We could share our mother’s preferences for care and work out a plan that alleviated her symptoms while using interventions only if they would make her remaining days more comfortable. I’m extremely grateful to the physician who made the time — in actuality, only about 30 minutes — to meet with us. We felt relieved to know that our observations and our mother’s preferences were taken into account in crafting the care plan. Our input also meant avoiding expensive tests of questionable benefit (and with the potential for harm) to someone at the end of life. And yes, the physician happened to be a woman. Female physicians’ greater focus on patient-centered communication and educational counseling may translate into improved care. A 2017 study showed that elderly hospitalized patients who were treated by female physicians had lower mortality rates and a lower risk of needing readmission to the hospital after discharge, compared with similar patients cared for by male physicians. Physician productivity remains an important metric for assessing the cost-effectiveness of care. But the patient experience, which includes care quality and patient satisfaction, is also essential — and is improved by the sorts of activities where female physicians tend to spend more time. In the past there was more flex in the system — enough time was buffered in to generate revenue by providing billable services and to cultivate relationships with patients and families. Today, if we want to change the care experience, we also need to change the way we pay for it. To improve care and avoid burning out physicians, perhaps it’s time to “count” and reimburse for the caring and communication aspects of physicians’ work. Everyone will benefit. Diane W. Shannon is an internal medicine physician who blogs at Shannon Healthcare Communications. This article originally appeared in athenaInsight.